A Windows server to connect to. 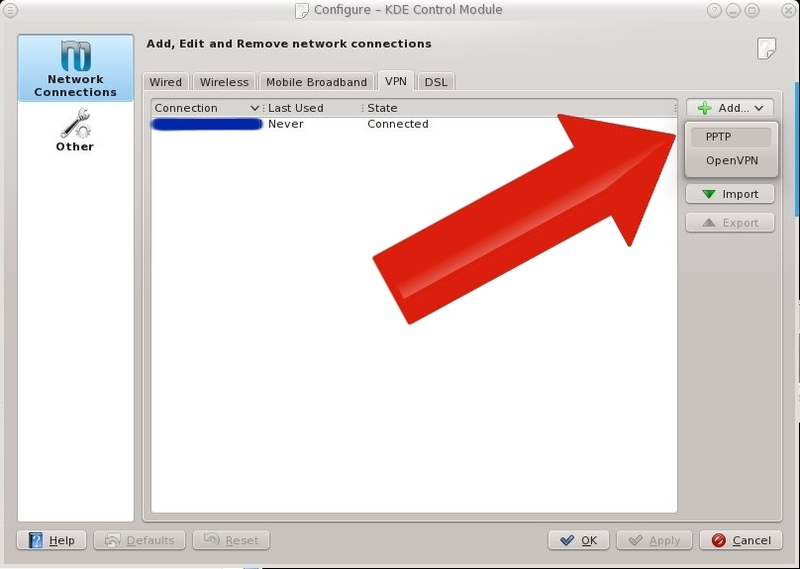 In the KDE Network Manager plasma module, go to the tab VPN, click add and choose PPTP. Enter and connection name you like. 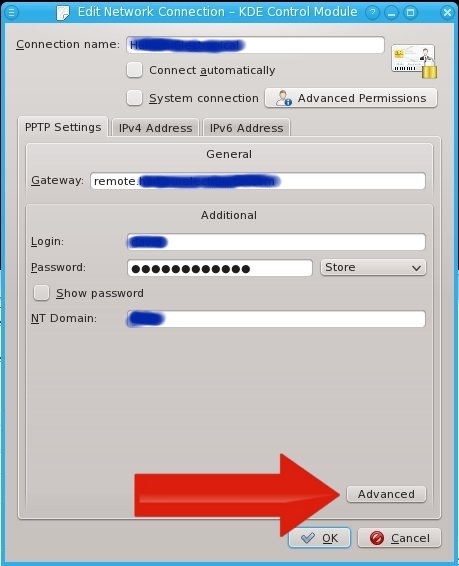 In the field "gateway" type the hostname or IP number of the Windows server you're connecting to. Under Login, Password and NT Domain, fill in your authentication data. Then click advanced. In the advanced window, disable EAP and enable MPPE. Then click OK.
Go to the tab IPv4. Under method, I chose Automatic (VPN). But Automatic (VPN) addresses only is also a nice option: it sets the IPs but no DNS settings. Go to the routes sub-tab. Switch on Ignore automatically obtained routes and Use only for resources on this connection to make sure the connection doesn't steal your traffic. 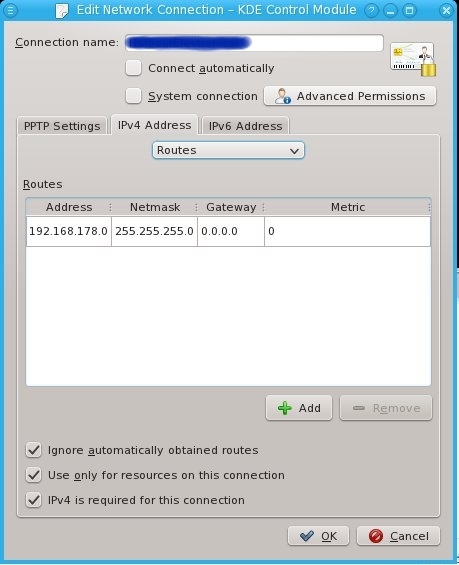 Then I entered a manual route: 192.168.178.0/255.255.255.0 to gateway 0.0.0.0 (it is a ppp device after all). You may want to configure IPv6 as well, but I don't at this moment, so I'm not documenting this. Click on the icon in the tray and connect. Dit bericht werd geplaatst in IT, Linux, Networking, Windows en getagged met Fedora 16, Linux, NetworkManager, pptp, vpn op februari 18, 2012 door David (admin). A colleague of mine has some family issues that require him to be home more often. However, work continues. So he started working at home with a laptop. Nothing special about that. What is special, is that we're running a piece of software ("RR") that has old-style telnet-like terminals, which is sending it's print jobs straight to the printer. His laptop has a direct VPN connection to the company network, but his printer doesn't. The old software ("RR") is running on a pretty new RHEL 5.6 installation. It uses CUPS to queue and deliver print jobs. In my situation, the RR printer has zero printers configured, there's another Linux server that has all printers configured and broadcasts those printers over the network. But you could leave that print server out. RR cannot reach the printer directly. But it can reach the laptop, which is running Windows 7 Professional. I searched for an IPP server that I could install on Windows, so that the printserver could use that to relay messages to the local printer, but I couldn't find any. Windows 7 still has the option to install an lpd server. It's not installed by default, but it's very simple to install. Go to the "Programs and Features"
Now go to the "printers" and share all printers you want to share. Don't use long names and names with spaces, like "HP Laserjet 4200 Series", which are hard to setup on the client. Use something short like hplj4200. If you can't get it to work, please check printer permissions and the firewall of the Windows 7 machine, which must have port 515 open. Dit bericht werd geplaatst in IT en getagged met CUPS, Linux, lpd, printer, vpn, Windows, Windows 7 op juni 5, 2011 door David (admin). Say you're living in China, and you have no web freedom whatsoever. Or in the Netherlands, and your favorite linux distro download site has been blocked by the corrupt "elite". Then having a tunnel to outside the country could be very useful. Dit bericht werd geplaatst in IT, Linux, Networking, Windows en getagged met privacy, vpn op juli 19, 2010 door David (admin). My personal Linux laptop is a real spider in the web. It's got OpenVPN connections to the office, to the datacenter, to serveral family members, etcetera. I love it. But sometimes, there are some tasks that Linux simply can't do, like running a vSphere client. For those situations, I use the second (Windows) computer on my desk to perform those tasks. However, this computer does not have a VPN connection right to the place I'm connecting to. Dit bericht werd geplaatst in Linux, Networking, Windows en getagged met openvpn, route, vpn op februari 23, 2010 door David (admin).